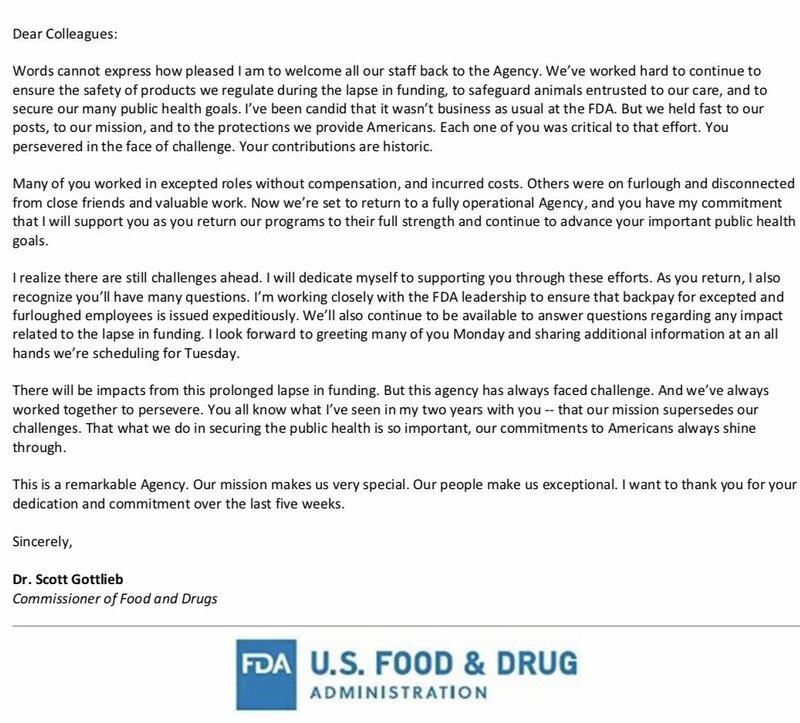 How Will the (Maybe Temporary) Reopening of the USDA and FDA Look? After the longest shutdown in American history, the government is up and running again. Well, “up,” at least. Last Friday, after 35 days of public outcry, Donald Trump signed a measure to fund the government for a period of three weeks. Trump plans to demand, at the end of this period, that his $5.7 billion plan for a wall on the country’s southern border be funded, so nobody quite knows how long this reopening will last, but on Monday morning, the government was open. The governmental bodies chiefly concerned with the food and agriculture industry—the USDA and the FDA—were, of course, not exempt from the shutdown. Those agencies have been reopened, but exactly what’s going on there isn’t simply business as usual. Few details have been forthcoming as to what sorts of impacts those will be. One of the biggest problems with suspending the USDA has been suspending the collection of data and the issuing of reports; AgWeb notes that there could be what they call a “data deluge,” where a backlog of crop reports flood the USDA, overpowering the agency’s ability to digest and respond in a timely manner. It is widely assumed that the World Agricultural Supply and Demand Estimates, a monthly crop report vital to the industry, will resume publication in February after missing January entirely—but will the USDA be able to compile the report with a limited timeframe and lots of data to dig through? There will also be a backlog of inspections for both the USDA and FDA to deal with; just this weekend, Whole Foods initiated a recall for spinach possibly tainted with salmonella.